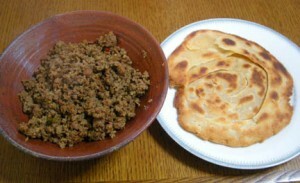 Dam Ka Qeema recipe by Ghazala at DesiRecipes.com. First of all, roast the cumin seed, coriander seed and the whole red chillies on tawa or frying pan for 15 seconds. Take sauce pan and put 2 table spoon of oil . Then add one chopped onion and fry until golden brown. Turn off the fire and take out the fried onions from the oil. Now put grind powder along with other onion and blend them into a paste. Now mix them in a mince meat. Later add all the spices , yogurt, meat tenderiser, raw grated papaya and the rest of other ingredients. Marinate the mince meat over night or at least for six hours. Later put the mixture on the fire and cook it for about 45 minutes, on a very low flame. While cooking remove the lid from the pan and stir it twice. Cover it again and let it cook till 4-5 minutes. Then you have to take one charcoal piece, place it on fire, and let it burn for a couple of minutes. While it turned red, remove it from the fire, hold it with cling. Immediately place it on the keema mixture, before placing it on the keema you have to put foil on the top of the keema. At once pour little bit of oil with lid or spoon on the top of the charcoal. Immediately cover it with the lid for one minute. You will see smoke coming out from the pan. That smoke will give you barbecue smell. Before serving, remove the coal along with the foil carefully. Now dam keema is ready to eat . Garnish it with some chopped onions, green coriander, grated ginger and few lemon pieces. My wife will try this at home. The recipe looks good. Could you please tell me how many calories there are in this recipe per serving?